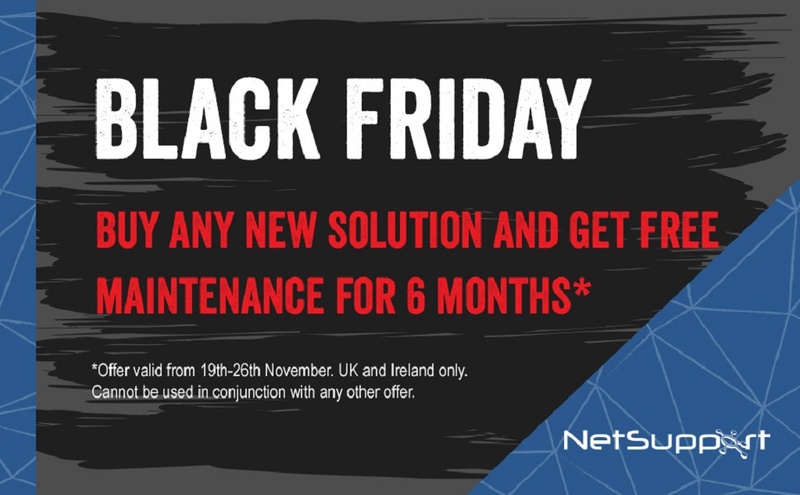 The NetSupport Black Friday offer is available to claim for the next 8 days! From the 19 – 26th November 2018, buy any new NetSupport solution and get free maintenance for 6 months. NetSupport’s award-winning solutions are developed with hundreds of schools and businesses across the world and by taking the time to listen to customer feedback, we ensure our award-winning solutions help them to manage their technology with ease whilst saving them time and money. That’s why we have over 17 million users and have won over 250 awards. In addition to gaining a fantastic solution, with NetSupport maintenance you get priority technical support from the NetSupport team, as well as access to all the latest features and product updates – ensuring your solution is future-proofed! For more details on our Black Friday offer, click here.